Whether you are on holiday or backpacking for long-term travel, having the best first aid kit for backpacking can make all the difference to your ability to ride out various minor injuries and ailments. Did you know that before we went travelling full-time, Tom was a practising nurse for ten years? Nobody knows more about the best first aid kit supplies than a nurse. Therefore, this post contains a wealth of knowledge about how to put together the best custom first aid kits for whatever kind of trip you plan to take. ‼IMPORTANT‼: This article is not intended as medical advice. You should always talk to your doctor or pharmacist for travel advice or regarding the use of any medication. Especially if you are pregnant or taking prescription medication. Take sensible care of your health. This article contains affiliate links. Retailers will pay us a small commission – at NO cost to you – if you buy anything once you click through. We have personally tested ALL of these products during travels on the plains of Africa, beaches of Asia and forests of Central America. Whether they contain affiliate links or not. 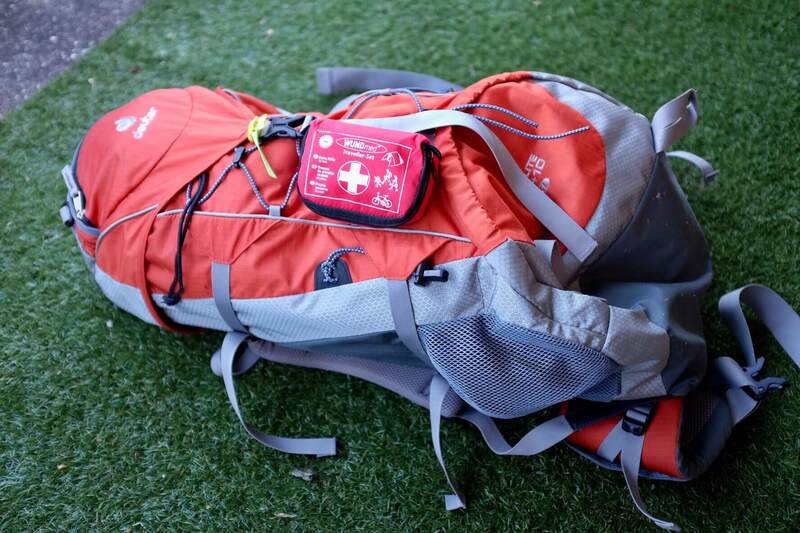 What’s the right size for the best first aid kit for backpacking? Should I buy a ready-packed best first aid kit for backpacking? Where to buy first aid supplies? What if I forget or run out of something? There is no straightforward answer to this. If you are packing for a road trip, then a vehicle first aid kit can be a lot bigger than say a hiking first aid kit. Under most circumstances, your travel medical kit should be as small and as light as you can get it. You also need to ensure that you have what you will actually need. The things needed in a first aid kit depends on a number of factors. Your individual medical needs should come first and foremost – if you know you have allergies or are taking prescription medication then these are the most important items in your medical kit contents. The rest of your first aid stuff really depends on the length of your trip, where you are going (which countries, and what kind of areas), what activities you are planning to do, and how far away you will be from medical attention if needed. We travel with a fairly minimalist first aid kit, but nevertheless, we carry all the medical kit supplies that cover most eventualities. Neither of us takes any prescription medication so we take a small blister pack of each type of over-the-counter first aid medical supplies. We usually travel to places where we could access a doctor within a day or so if needed. We have done rafting, abseiling, zip lining, canoeing and ALL kinds of nature trips. Without needing anything more than our small first aid kit. Maybe we were lucky! This is our travel first aid kit, pretty small, isn’t it? Of course, you can. But you are not likely to find a ready-packed comprehensive first aid kit that contains all of the items listed here, even just the essential ones. More likely what you will find is lots of first aid kit manufacturers trying to sell you a “complete first aid kit”, containing loads of pieces. I would estimate that 80-90 of these pieces are various sizes of bandage and gauze. Most are probably not really necessary for your travels. What we have done in the past, is bought a small and basic ready-made travel first aid kit as a starting pack, and added in the items we want to use. If you are wondering where can I buy a first aid kit, then you can find starter first aid kits for sale on Amazon. Alternatively, your local pharmacy or drugstore will have them, and some supermarkets also sell them. This is a great example of a small first aid pack that would have some simple first aid kit contents for you to add to. You can source your first aid kit refills from a variety of places. It should go without saying that any of your prescription medication included in your first aid pack should be obtained from a doctor. Over the counter medication can be bought from a pharmacy. If you do decide to buy medication online, make sure you are buying from a reputable supplier. Amazon do a great line in first aid kits and supplies, many of which we have linked to in this article to help you in your purchases. When on the road, first aid refills can be bought along the way. We have yet to travel to a single country where we couldn’t get anything we needed. If buying medication over the counter in developing countries, be sure to check the contents to make sure that blister packs are intact and the medication is the same brand as the box, and not past its expiry date. If you set out and realise there is something you need that you haven’t packed, don’t panic. Emergency first aid kit products can be picked up in most countries. We once found ourselves stuck without wound dressings in a seaside village in Vietnam, on a Sunday when the local pharmacy was closed. We asked our hotel manager if he could direct us to an open pharmacy, and he was kind enough to drive in his car to the nearest open pharmacy and bring us back what we needed. Just ask a local – they can usually direct you to the nearest place to help find your first aid kit needs. Although every traveller and trip will be different, every best first aid kit for backpacking should contain some basic items covering many common situations. Here is our recommended best first aid kit for backpacking contents list, in no particular order of priority. Brand names will vary per country, however, we have tried to keep the list as generic as possible. The first section is our recommendation for a basic first aid contents list, and at the end, we have covered the more optional stuff in a first aid kit. This section contains our recommendations of items that should be on most, if not every, first aid kit supplies list. Ibuprofen acts as an anti-inflammatory whilst paracetamol will help to bring down a fever. Both are also effective as painkillers. We usually carry a small blister pack of each in our kit as they are some of our most basic first aid kit necessities. We got badly sunburned whilst snorkelling in Panama last year (stupid, rookie traveller error!) and the ibuprofen really helped calm the skin inflammation. If you are shopping from outside the US, click here to browse ibuprofen packs in your location. I usually end up needing an anti-histamine at some point, once the mosquitos discover my blood. Pollen, dust and other allergens may also cause reactions and anti-allergy medication can seriously reduce discomfort on your travels. If you suffer at all from any of these, then anti-allergy pills and perhaps a topical cream should be some of the most important stuff in a first aid kit. If you are shopping from outside of the US, use this link to browse anti-allergy medication in your location. If you are travelling with small people, then you will probably have these at the top of your best first aid kit for backpacking list! As a couple, we usually carry only a few sticking plasters of each size, plus a small roll of medical tape and a couple of small bandages in case of deeper wounds. Touch wood, we have never yet needed the bandages! When buying ready-made, even the most simple first aid kit includes many bandages of all sizes but in the expert view of Tom, many or big bandages are probably not needed for most travellers. If you need to treat a deep wound or a lot of blood, it will need a specialist’s attention in any case. If you are planning a hiking or mountaineering trip into remote areas, you may want to pack a few extra bandages into your backcountry first aid kit given you may be further away from medical attention. See below our tips for your wilderness first aid kit list. An important staple of any good first aid kit. This can be some kind of antiseptic cream or wipes, or iodine also works well. Anything to clean a wound, especially before it is bandaged. Tom once had a cut on his foot when we were walking around the streets of Bangkok during Songkran. This is the new year celebration which involves a lot of water being sprayed around on the streets and over people, and the water gets pretty filthy from the pavement dirt. He cleaned it twice or more each day with iodine, as well as changing the dressing, and it healed as normal within a few days. If you are shopping from outside of the US, click here to browse iodine wound disinfectants in your location. Recommended first aid kit contents, for pulling out splinters or for cleaning grit or sand from a wound. If you are shopping from outside of the US, click here to browse prices of first aid tweezers in your location. Delhi belly, travellers tummy, Montezuma’s revenge… even the sturdiest travellers can suffer from the gastric problems that can accompany foreign travel. Usually, the body just needs some time to adjust to the new germs and bugs in a different environment. Nevertheless, being laid up in bed in close proximity to a toilet can ruin precious days of travel. Defence is, therefore, the best form of attack. Anti-diarrhoea medication should be among the most basic first aid kit contents when travelling. Immodium is one of the most common and effective anti-diarrhoea medications. Coal tablets are also effective and can help to filter out the bugs causing food poisoning. Particularly if travelling to developing countries where the water may not be of drinkable quality, such medication should be on every backpacking first aid list. If you are shopping from outside of the US, click here to see the prices of immodium packs in your location. Metoclopramide and ondansetron are both very effective remedies for nausea and vomiting. I am sure you will be grateful that there are no stories we wish to share further on this topic! Insect repellent and sun cream, although not technically treating illness or injury, should be an essential part of your first aid kit requirements. TIP: Looking for the best insect repellents to protect against bites whilst travelling? Check out our guide to the 10 Best Insect Repellents – Weapons You Should Have In Your Travel Arsenal! Both being very fair skinned, sun cream and aftersun lotion is something that is always among our emergency first aid kit essentials. When we were travelling in Central America, we discovered you can buy aloe vera gel laced with lidocaine (a painkiller), which is the best thing we have found as a sun burn treatment. Normal aloe gel also works well, can be found in most countries and should always be in your first aid kit pack. If you are shopping outside of the US, click here to browse prices of aloe vera gel in your location. Make sure that you take a sufficient quantity of any medication you are currently taking as part of your personal first aid kit contents. Also make sure you pack a copy of your prescription, in case you need it at airport security or for more of your medication in your destination. Whilst not technically one of the things you need in a first aid kit, travel insurance should be considered essential for everyone. EU citizens within the EU are usually covered however most other international travel requires some kind of additional insurance. World Nomads do a very comprehensive cover for even the most adventurous of long-term travellers. We have been using them since travelling full-time and can recommend them for transparent coverage, great value and customer service. You can even start your cover with them whilst you are already on the road! When travelling in certain countries, a vaccination certificate may be required as part of the border controls. Make sure you check this before you travel. Keep your certificate stored safely with your other travel documents. These are things that you can carry if you wish. They may be considered essential depending on your individual circumstances. This will depend on where you are planning to travel. There are different types of anti-malarial pills available with different benefits and contraindications. Many people assume that malaria pills need to be included in any international best first aid kit for backpacking list, but the reality is that even in many developing countries, malaria is only found in remote areas. You should consult with your doctor or local travel health clinic to check if you need malaria pills. They can also make sure any malaria prophylactics are the right ones for your health and your travel circumstances. Something you should pack in your emergency medical kit contents if you plan to travel in remote areas away from medical help. It can be effective against a wide range of bacterial infections. Again, you should discuss this with your doctor as you will likely need a prescription in any case. (Also, you may need an alternative if you are allergic to antibiotics). Some people can live without this however it is really effective against acid reflux. As an occasional sufferer, it has a real impact on what I can eat. When I use a treatment, it really helps reduce the symptoms. If you are shopping from outside of the US, use this link to browse antacid tablets available in your location. These are usually powders that are mixed with water. They are great for rehydrating after a bout of travellers tummy, or if you have lost a lot of body fluids through sweating. Or even for a bad hangover! They rebalance the salts in the body, meaning they are more efficient at hydrating the body than water alone. A few individual sachets packed into your travel first aid kit can be invaluable to helping recovery after dehydration. If you are shopping from outside of the US, use this link to browse rehydration powder in your location. We travel with a Steri-pen these days. It is a fast, safe and reusable way of purifying water using UV light to kill bacteria, which makes the water safe to drink. For shorter trips or ad-hoc needs, water purifying tablets are another consideration for your best first aid kit for backpacking. The ability to purify water is particularly important if you are planning to spend longer periods in remote areas, where access to clean water may not be guaranteed. If you are shopping from outside of the US, click here to browse Steripen prices in your location. If you are shopping from outside of the US, click here to browse water purifying tablets in your location. I always carry a small pot of white tiger balm when travelling. It is good for headaches, stuffy noses and as a rub for aching muscles. In fact, so many backpackers swear by tiger balm for so many things, it is almost like a full first aid kit by itself! If you are shopping from outside of the US, click here to browse tiger balm in your location. This is definitely not one of the items needed in a first aid kit as an essential. However, we have found it very useful against a number of ailments. We use ours on sunburned skin, insect bites, headaches and swelling after a bump or twisted ankle. Ours can be used as a warm pack as well. This makes it a more versatile and justifiable addition to our first aid supplies list. If you are shopping from outside the US, click here to browse hot and cold packs in your location. Safety pins and scissors are useful parts of a homemade first aid kit, for cutting and pinning bandages. However, beware that they cannot usually be carried as hand luggage on a flight. A thermometer can be useful for identifying fever. Particularly in these times of the Zika virus, then condoms are advisable, in addition to your usual birth control. As a hiker, you are likely to suffer from more blisters and possibly insect bites than other travellers. Therefore, your travel first aid kit contains should contain plenty of antiseptic, plasters and gauze bandages. If you decide to use blister plasters, then one of Tom’s top tips is only ever to use them on a blister that has not burst. During his time as a medic in the Swiss military, he ended up treating horrible foot wounds on rookie soldiers who had gone marching. They had used blister plasters on burst blisters, which stops the air getting to them and prevents the healing process. Moleskin is a better option as it allows the air to the wound. Plenty of DEET-based repellents will help avoid bites, and bite treatments in case you do get bitten. In case you get caught in a storm, make sure your hiking first aid supplies are packed in a zip-lock or dry bag. Anything waterproof that will protect your precious pills and bandages. If you are shopping from outside of the US, click here to check browse waterproof plastic bags in your location. Bear in mind that you may not be able to find a first aid supply store if you are away from residential areas, therefore travel size first aid supplies are essential to keep your first aid kit weight down. If you are travelling to run a marathon then similar to the above, you will need treatments for blisters and also consider things like ice/heat packs in case of sprains, strains or just muscular aches and pains. If you are planning on water sports like rafting then make sure your best first aid kit for backpacking contains extra bandages, medical tape and plasters in case of cuts and bruises. Similarly, if you are planning to participate in any team contact sports like football, rugby or netball. Even when travelling and trying to keep pack weight light, remember that protective gear can mitigate the need for first aid supplies. Wear a helmet if you are cycling, or use knee/shin/elbow pads or a gumshield as you would at home for any sports that may require it. If you are planning to backpack through areas with dangerous animals like snakes or scorpions then you may need a few more advanced first aid kit items such as a bite kit. Much of the advice here is the same as for hikers. It may be more difficult to find first aid kit refill supplies when you are in such remote areas. Again, try and find mini first aid kit supplies for your pack. If you are shopping from outside of the US, click here to browse bite kits in your location. Although this is not our specific area of expertise, we have met some travelling families during our time on the road and picked up a few tips. If you are packing for a family, it may be that you have to compromise on pack weight and size and pack a big first aid kit. You will likely need extra supplies of plasters and bandages, as well as ensuring that you have both adult and child versions of things like pain medication. A thermometer is recommended as kids can be more prone to fever. If you are shopping from outside of the US, click here to browse travel-size medical thermometers in your location. Diaper rash can be exacerbated in hot countries so treatment cream is also advisable even if your little one doesn’t usually suffer with it. Double down sunscreen, using one with a high SPF and make sure you have insect repellent with DEET levels suitable for the age of the child. If you are shopping from outside of the US, click here to browse childrens sunscreen and bug repellent in your location. So this is the round-up of the best first aid kit for backpacking packing tips, from Tom, TripGourmet and nurse. Your own travel first aid kit needs will depend on your personal and travel circumstances. However, we hope these pointers help you make your own first aid kit for whatever kind of trip you plan to take. What’s in a first aid kit? Well, here’s ours! For more packing and pro-traveller tips, you may like our post about our Best Cameras for Travel Photography or our post about the Best Anti Theft Travel Bags and Accessories to keep your Travel Gear Safe. IMPORTANT: (because we cannot emphasise this enough!) This article is not intended as medical advice. You should always talk to a doctor or pharmacist for travel advice or regarding the use of any medication. Especially if you are pregnant or taking prescription medication. Take sensible care of your health. We must be careful while traveling. While traveling, we should take the necessary things to get. you are right carry the first aid kit while travelling. I read your blog and i get the valuable information on this blog. I found this much useful packing tips. Thanks for such post and please keep it up. Exactly 🙂 You can’t be prepared for everything, but at least for the worst. Thank you for reading our post. This is a really comprehensive list and truly helpful. I think it’s so important to tailor your kit to the kinds of activities you’ll be doing. I could have used an antibiotic on a recent trip to Bali after cutting my foot in a rice field. I think I’ll take your advice and talk to my doctor about getting something! Hi Heather, thank you very much for your comment. Antibiotics are a good thing to have with you and it is very wise to talk to your doctor first as well. He can prescribe you exactly what you need and also explain you, when exactly you should take them. I wish you many more safe trips! Hi Mags, thanks for stopping by. I’m glad you liked the recommendations and hope you can use them packing your own first aid kit. These are phenomenal tips! I just did a detailed first aid kit guide myself! I’m not a nurse, but I feel well-prepared since I have just about all the same things as you do! The only thing I didn’t have in mine is tweezers, but those are in my makeup bag, so I still have them to use! 😉 Great tips! Hi Paige, we’re glad you liked our article. Being well prepared for any illnesses and accidents makes travelling a lot easier. Thank you very much! Great tips! I carry a small bag that’s similar. Thankfully I’ve never needed it for anything serious but it’s great to have for small problems. Thanks for reading Nathan! I agree, it is great to have around as a backup, but we would always try to find a clinic in case of more serious or persistent issues.Thanks for your comment and have a great start to the week. I have a lot of this in my medicine first aid when I travel. I feel like its really important to bring it. You never know when what type of sickness hits you. Thanks for your comment Karla! I agree, it is really important, especially if you are planning to be in a more remote area or away from a clinic for a few days. Wish you safe travels and a good week. These fantastic tips for a travel first aid kit. Somethings I had never thought to put in the kit, so thank you! Now I know what to buy. Love the the little bag too! Thanks for stopping by Lucy and glad you found the post useful! Having a well-stocked first aid kit can make all the difference if you find yourself stuck without access to a pharmacy or clinic, even just overnight. Wish you safe travels and a great start to your week. This is a great list of items! I am currenty on a one year trip and you have included some things that I definitely wished to have taken with me. Especially the rehydration powders and tiger balm. So useful! Hi Wiebke, thank you for commenting. I once laughed about Tigerbalm, but since we’ve been in SE Asia, I changed my mind a bit about it 🙂 It’s so good for so many different things! I usually try to pack something like this, especially for any longer trips. It is a nice piece of mind to have things like advil, bandaids, and cold medicine just in case. It has come in handy more than a few times, especially when I have cut myself when hiking and did not have to worry about finding an pharmacy nearby. Hi Drew, thank you for checking by. The trick about a good first aid kit is always to keep it in the right size. Especially during hiking you probably don’t want to carry 2 kg of bandaids around with you 😀 Cold medicine can come in very Handy as well.